The places where Calgarians work and play are shifting gears in chameleon-like fashion. Bicycle shops have become wine bars. Nightclubs are now fitness studios. And overlooked plots of land have morphed into company headquarters. Avenue took a look at five spaces in the city recently renovated or reimagined by architects and designers who have raised the bar for local commercial interior design, and by owners who have been willing to take creative risks to create beautiful places to do business. This bicycle shop and residence-turned-lounge in Mission combines an original 1905 home, its 1950s storefront addition and a new rooftop patio to create one cohesive space where guests can nosh and enjoy any of the 70 wines available by the glass. The building has also received heritage status from the City. “It took a lot of imagination to see what it could be,” says owner Phoebe Fung, who first saw the 79-year-home of Mission Cycle after it had sat empty for two years once the bicycle shop moved out in 2005. By December of 2008, Fung had redeveloped the space and opened Vin Room. The building’s new aesthetic is decidedly contemporary, but Fung kept the original finishes and materials wherever she could, such as the basement’s concrete floor and the hardwood on the main level. 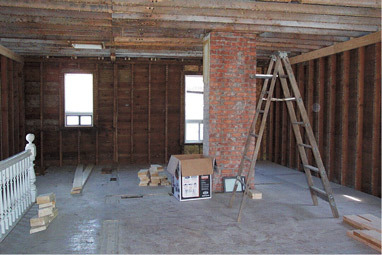 She also restored the original cedar shake on the exterior and salvaged 105-year-old bricks from the broken-down chimney for use in one of the wine cellars where private parties are hosted. For fresh character in the design, Fung relied on the imagination of local designer Sally Healy, who used viticulture as her inspiration for the two-storey wine bar. The main level comprises the New World Room, featuring modern lines and edgy styling. A bold palette of yellow, black and cream has been used, including a graphic bank of matte black Tom Dixon lighting hung at various heights along the front bar. A state-of-the-art Enomatic wine system from Italy — the largest installation of the wine machines in Canada — keeps opened bottles fresh and on display. 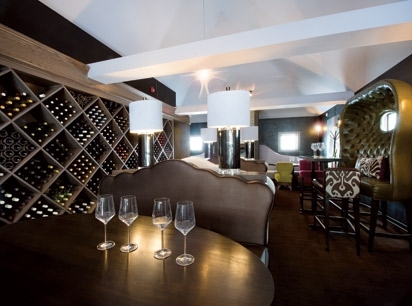 Upstairs, the cozy Old World Room is set beneath a vaulted ceiling and is anchored by an impressive cellar wall. Healy trimmed the sleek fireplace with iridescent glass tiles in the same magenta and chartreuse featured throughout the room in the upholstery. Custom-designed booths mimicking horse-drawn carriages provide visual impact, and black damask wallpaper gives the space a living room feel that encourages guests to linger. “People enjoy themselves and spend the evening with us,” says Fung. Vin Room owner Phoebe Fung worked with Calgary designer Sally Healy to convert the vacant Mission Cycle shop into a hip wine bar, while saving as much of the circa 1905 structure as possible. 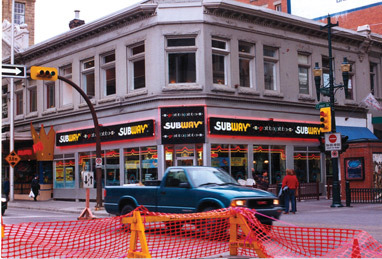 The building has since received Heritage Status from the City of Calgary. 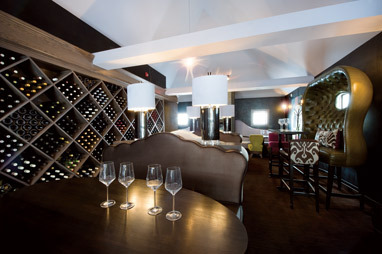 In December of 2008, Vin Room opened its doors. Business partners Wissam Akl and Daniel Lewis created SFM Lifestyle Salon & Spa just over a year ago as a fully integrated boutique salon and spa in midtown Calgary to meet the demands of the city’s increasingly cosmopolitan clientele. Lewis, whose background is in architecture and interior design, handled the design of the space, along with their in-house design company and says all of the colours are drawn from the local landscape, including the company’s signature purple, which can be found in the evening sky just as the sun dips below the horizon. “When I first walked into the space, it was a lot of beige and low ceilings,” says Lewis. 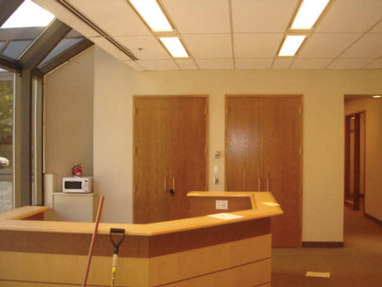 The space used to be home to the Alberta Mental Health Board offices, and Lewis says he had trouble convincing Akl to even consider it for their stylish salon. “It took a lot of courage on his part,” says Lewis. The grand lobby lounge was fitted with a gleaming Carrera marble greeting desk displayed beneath dramatic, 20-foot ceilings. A cascade of backlit shears tumble down the wall behind it, and a white-and-purple, diamond-tufted roll-arm sofa runs the entire length of the opposite wall. Lewis says the intent of the sofa was to create a feature item that would be a trophy piece. “We wanted something a little bit off-centre,” he says. 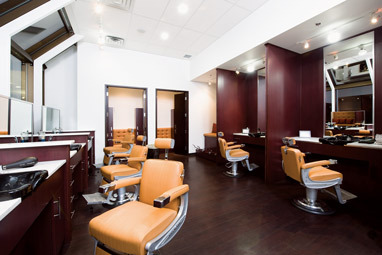 All of the interior rooms in the salon spa are purpose-built and encourage social interaction, from the elegant nail lounge with stations for 10 clients, located just off the lobby, to the clubby M cuts-shaves-shines, which offers an extended line of services for men in a private area. Lewis says the M room’s classic Takara Belmont barber chairs and palette of coffee and tan were intended to channel a Rat Pack vibe. Deeper in the salon spa, a row of three treatment rooms, as well as a bank of sleek marble styling stations and a communal glass colour bar, have been fitted around a central sanctuary lounge. Guests unwind here among tuxedo-style sofas piled high with pillows and accented with soft lighting and soothing music. Owner, Daniel Lewis utilized his architecture and design background to create this colourful spa that draws its palette from Alberta’s landscape. 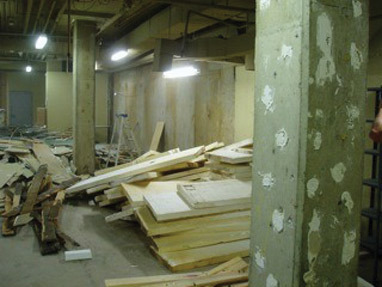 His business partner, Wissam Akl, helped with all the major design decisions as the SFM team converted the former downtown Alberta Mental Health office in 2009. Dr. Shaun Marty was tired of seeing patients hurt by the very fitness regimens that were supposed to be making them healthier. His solution: build a functional fitness space as an extension of his multidisciplinary health clinic. The only catch was creating a welcoming feeling in the space that was available in the clinic’s building: a former nightclub-turned-storage facility in the basement. Calgarians of a certain age might remember the room as Three Cheers, a popular bar along what used to be known as Electric Avenue. Interdisciplinary design firm Market Grade crafted the new space with self-professed “quiet guy” and architect Paul Stady at the helm. The new boutique fitness space has an airy feel that belies its below-ground location. Globe lighting runs in rows along the over-height ceilings, and full-length mirrors are strapped to the foundation walls. The floor is covered in interlocking rubber tiles that provide cushioning for clients as they exercise, but they can also be easily pulled up in case of flooding. It’s a consideration the design team discovered after the original hardwood flooring was put in place — the room flooded the first night after the floor was installed. The predominately white-and-concrete space has also been designed for function. An overhead glass door at one end allows the room to quickly separate into a soundproof studio for Pilates and yoga classes and a personal training area, each with their own light and sound controls. 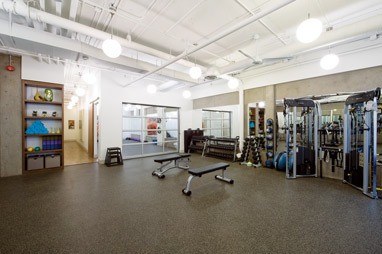 Much of the inspiration for the fitness studio’s clean, modern aesthetic was drawn from the clinic upstairs. Stady says creating the same feel below grade wasn’t as challenging as laying out the space around the building’s structural concrete footings. However, his team did get one unexpected bonus when they discovered an extra two and half feet of space concealed behind the original Three Cheers walls, which had been sprayed out with stucco. 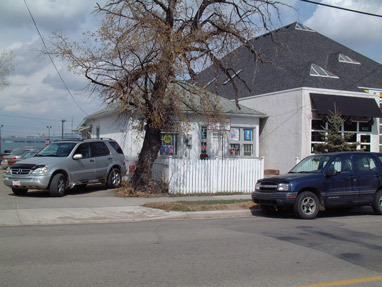 101, 602 11 Ave. S.W. Dr. Shaun Marty hired local design firm Market Grade last year to create his vision of a distinctive Beltline wellness centre. Architect Paul Stady transformed the former-Electric Avenue Three Cheers nightclub space into a boutique fitness facility by flooding the dingy room with light and neutral colour. It was a simple errand that led graphic designers Cheryl Starr and Rob Rodé into temptation. The couple had been leasing office space in downtown Calgary for 12 years when Rodé happened by a tiny lot with a run-down house for sale in Sunalta while he was out for a walk. Owning their workspace made a lot of sense, and the idea to redevelop the site was born. The problem was how to create a useful building on such a small inner-city lot. “We’d always thought this was an under-the-radar location that was close to downtown and had a lot of potential,” says Starr, adding they never expected the lot’s 25 feet of street front to drive the potential. “The project is conceptualized with a warehousing industrial construction,” says architect Richard Davignon of the three-storey building he designed for the couple. He describes his process as sculpting the building from the masonry blocks, which were the main building component. Starr says the intent was always to do a very minimal, simple design, which is evident in the unadorned brick exterior that wraps around polished concrete floors, white gallery walls and sky-high ceilings. Workspaces are set in both the front and back of the building and feature a mezzanine level accessed by interior spiral staircases. Now complete, Büro — German for “office” — is a creative hive with several independent designers and production artists working out of a shared space. 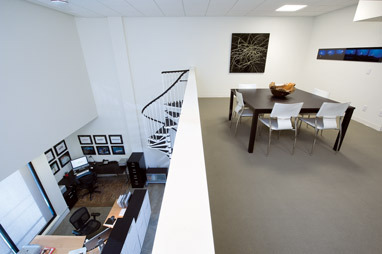 SQ Art Projects, an offshoot of nearby Skew Gallery, is located on the main floor, and works from the gallery hang throughout the building. “We had a vision to create this thing that attracted like-minded people, and we did it,” says Starr. In 2008, graphic designers Cheryl Starr and Rob Rodé hired Calgary architect, Richard Davignon to design this three-storey office complex in Sunalta, which used masonry blocks as the main ingredient in a building that maximizes space and style with a minimalist and modern appearance. Subway and Falafel King are out, and local fashion designer Lara Presber and style guru Karen Judge are in. They are two of the 25 tenants at Fashion Central, a downtown shopping destination that also boasts international brands Wolford and Betsey Johnson, as well as beauty megastore Murale. The selection is appealing, and the renovation of the historic Alberta, Hull and Macnaghten blocks opposite the Bay downtown is as stylish as the tenants. Developer David Neill, who has also resurrected a number of the city’s other historic structures, including the Clarence Block and the Alberta Hotel Building, bought the three buildings between 10 and 13 years ago. The reconfigured Fashion Central opened one year ago. “We waited for the street to mature to the point that it would support a renovation for fashion,” he says of the extended timeline. Marrying three buildings constructed at different times and on different foundations was one of the greatest challenges of the project, says architect Frank Kaspar, whose Calgary-based firm, Abugov-Kaspar, created the design. To entice shoppers to go up to the second level, the firm constructed a central atrium, unifying the space and bathing it in light. Abugov-Kaspar also preserved the historic corner street front by placing a set of glossy red stairs at the core of the building, instead of the more-typical corner placement, which would have maximized interior floor space. From the top of those stairs, shoppers can see a 20-foot mural depicting fashion through the decades, painted by local artist Eric Louie on the outside of the Macnaghten Block. To reveal the buildings’ original brick and sandstone, the team had to remove several layers of paint and finishes. They used historic photographs to understand the earlier architecture, but the project wasn’t a restoration, and wasn’t intended to make the buildings look like they originally did. Kaspar says trying to do reproductions doesn’t work, because it never looks authentic. More effective, he says, is contrasting historic and modern elements to give the aged items some context. This has been done with Fashion Central’s corner clock, which was an original feature, but has been updated with a new timepiece. Stephen Ave. and 1 St. S.W. Under developer David Neill’s leadership, the Encorp Group created Art Central, and in 2010, opened Fashion Central. 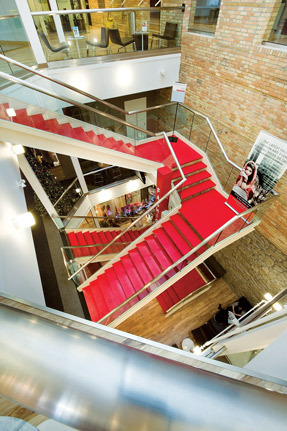 Architect Frank Kaspar of the Calgary firm Abugov Kaspar combined three, century-old buildings to create the retail junction, which currently hosts 25 local and national designers.